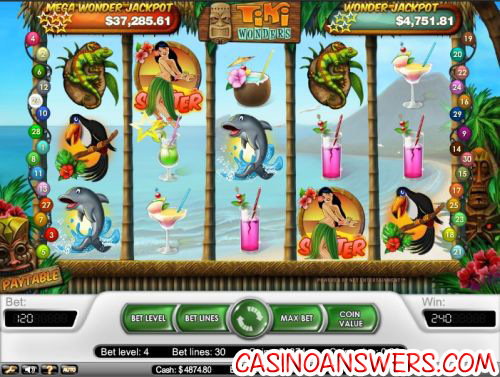 Tiki Wonders Video Slot Guide & Review - Casino Answers! Tiki Wonders is a 5-reel, 30-line video slot developed by Net Entertainment, featuring a wild symbol, scatter wins, free spins and two progressive jackpots. You can play the Tiki Wonders at Tower Gaming Casino and Casino Euro. Coin values on the Tiki Wonders slot game are $0.01, $0.02, $0.05, $0.10 and $0.20. From there you can set 1-30 paylines at 1-4 bet levels. You can bet as little as a penny per spin on the Tiki Wonders slot machine up to the highest total bet of $24. Tiki Wonders has a low betting range, which is great for lower stakes and casual slots players. 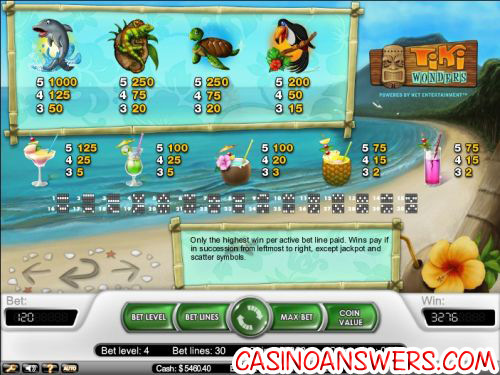 To play Tiki Wonders with all 30 lines at the fourth bet level, press the “Max Bet” button. To play with other wagers, hit the Spin button (circular button with the arrows on it). The highest paying symbol on the Tiki Wonders online slot game is the Surfer symbol. If 5 Surfer symbols land on the reels of the Tiki Wonders video slot, you will win the 10,000 coin top fixed jackpot. The Surfer symbol is the wild and will substitute for all other symbols except for the jackpot and scatter symbols. Tiki Wonders’ scatter symbol is the Dancer symbol. If you 2, 3, 4 or 5 scatter symbols land on the reels of the Tiki Wonders video slot, you will win 2X, 4X, 50X or 400X your total bet. If 3, 4 or 5 Scattered Dancer symbols land anywhere on the reels, you will win 10, 20 or 30 free spins with a 3X multiplier. Additional free spins can be won during the free spins feature. Free spins are played at the same bet as the spin that activated the free spins feature. Tiki Wonders features two progressive jackpots – Wonder Jackpot and Mega Wonder Jackpot. At the time of this writing, the Wonder Jackpot is at $4,752 and the Mega Wonder Jackpot is at $37,285. During the slot game, symbols will sometimes have stars ontop of them. The Wonder Jackpot is triggered by hitting 4 star symbols and the Mega Wonder Jackpot can be won by hitting 5 star symbols. The more you bet on the Tiki Wonders video slot, the greater your chances are of winning either of these jackpots. To try and win them, start playing the Tiki Wonders slot game now at Tower Gaming Casino! Tiki Wonders has an autoplay mode that can be opened up by hitting the “Auto” button. You can play 10, 25, 50, 75, 100, 250, 500, 750 or 1000 autoplay spins at a time. In the advanced settings, you can set the Tiki Wonders autoplay mode to stop on any win, if free spins is triggered, if the jackpot is won, if a single win exceeds (any amount you input) and if cash increases/decreases by (any amount you input). You can stop the autoplay mode at anytime. Tiki Wonders has a great theme that players can enjoy, two progressive jackpots, a high top jackpot and a free spins feature with a generous multiplier. To play the Tiki Wonders video slot, sign up and make a deposit at Tower Gaming Casino! Can USA players play the Tiki Wonders video slot for real money? Unfortunately, USA players are unable to play the Tiki Wonders slot machine at this time. For an alternative, players from the United States can play the Tiki Lounge video slot at the USA-friendly Caribbean Gold Casino. Can Macintosh users play the Tiki Wonders slot game? Mac users cannot only use Tower Gaming Casino‘s no-download client, but Tower Gaming also has a downloadable Macintosh client for Mac users to download the casino. For more on Tower Casino, please read our review on Tower Gaming Casino. Is there a free Flash game of the Tiki Wonders video slot for real money? You can play a Tiki Wonders Flash game at either Tower Gaming Flash Casino and Casino Euro‘s Instant Play casino. You can play for free or play for real money. If you experience difficulties with the Flash slot game, you can download the latest version of Adobe Flash Player. How do I win the Tiki Wonders progressive jackpots? To win the Tiki Wonders progressive jackpots, you must hit 4 star symbols for the Wonder Jackpot or 5 star symbols for the Mega Wonder Jackpot. Whatever happened to Tiki Casino?